There on her forearm, next to a small brown birthmark, were six tattooed numbers. 'Do you remember me now?' he asked, trembling. She looked at him again, as if giving weight and bone to a ghost. 'Lenka, it's me,' he said. 'Josef. Your husband.' During the last moments of calm in prewar Prague, Lenka, a young art student, falls in love with Josef. They marry - but soon, like so many others, they are torn apart by the currents of war. In America Josef becomes a successful obstetrician and raises a family, though he never forgets the wife he thinks died in the camps. But in the Nazi ghetto of Terez? ?n - and later in Auschwitz - Lenka has survived, relying on her skills as an artist and the memories of a husband she believes she will never see again. Now, decades later, an unexpected encounter in New York brings Lenka and Josef back together. 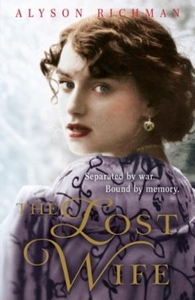 From the comfort of life in Prague before the occupation to the horrors of Nazi Europe, The Lost Wife explores the endurance of first love, the resilience of the human spirit and our capacity to remember.